The balloon burner that pilots have been asking for! Ultramagic burners are the result of more than 30 years experience of design and manufacture. The Ultramagic MK-32 range of burners combines the best of the acclaimed MK-21 and Powerplus marques. The MK-32 was designed by Paolo Bonanno in conjunction with the Ultramagic team of Aeronautical Engineers. They are produced completely at the Ultramagic factory and have been tested to the absolute limits in all climatic and flying conditions. 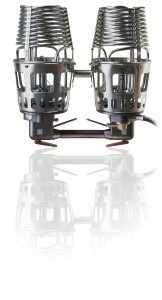 The MK-32 is a very high specification burner which is reliable whilst also not being too heavy. Special attention to ergonomics has been incorporated into the design to enable easy safe operation whilts maintaining comfort in use. Ease of assembly and maintenance are assured whilst also introducing many new innovative concepts to help make flying even more safe and enjoyable. 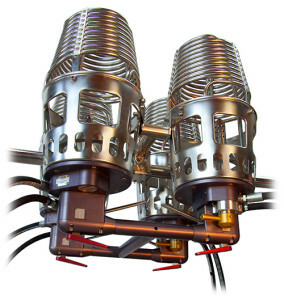 The MK-32 is available in double, triple and quad designs with a choice of coil and pilot light configurations. A choice of coil configurations are available as follows. Very high output coils under development. The MK-32 burner has many unique features as follows. The liquid/whisper valve handle and main valve handle can be operated simultaneously with a single hand, thus enabling the pilot to open both valves whenever necessary. A ground breaking design of a fuel pre-heater for the liquid pilot light has been incorporated which reduces the accumulation of oil and deposits from dirty or poor quality fuel in the regulator and pilot light circuit. 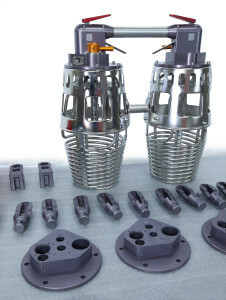 Fuel intakes (hoses) oriented at 45º, to reduce hose bending at the frame corners. Intakes are also offered with 90 degree elbows to accommodate different frame geometries. An easy installation and removal independent hydraulically activated main valve remote handle system is available as an option. Fits the existing centre gimbal mountings for MK-21 to enable an upgrade using existing burner frame. Systems are assembled in modules. These modules are independent, thus enabling an easy inspection, replacement, and identification of possible malfunctions. Single hand design: Left/Right hand specific parts have been avoided to simplify and reduce stocks of spares and minimize risk of inadvertent swapping / confusion during maintenance. Further maintenance simplification has been with the reduction of different locking means and screw sizes, thus less tools are required. The design enables easy removal of the entire pilot light assembly, enabling a comfortable access for cleaning, inspection and lubrication of the pilot light outside the burner can. Conventional nuts have been replaced with riveted nuts in the coil and can supports, to simplify the assembly and disassembly.